Traffic is moving much easier in the East Liberty neighborhood of Pittsburgh and the air is a bit cleaner, thanks to a Carnegie Mellon pilot study on traffic signal controls. 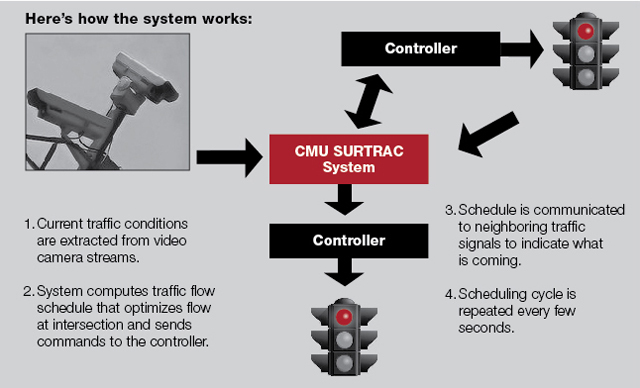 The Scalable Urban TRAffic Control (SURTRAC) is the latest project to be released by CMU's Traffic21 research initiative. Stephen Smith, director of the Intelligent Coordination and Logistics Laboratory (ICLL) of the Robotics Institute, attacked the tough problem of daily congested road networks in urban centers. Combining concepts from the fields of artificial intelligence and traffic theory, his team developed technology to allow traffic signals to communicate with one another and collaboratively adapt to actual traffic conditions in real time. For the last nine months, the technology has been used in a network of nine lights and has successfully enabled traffic signals to quickly react to changing conditions, reducing traffic congestion and the resulting extra vehicle emissions. "The reductions of 40 percent in vehicle wait time, nearly 26 percent in travel time and 21 percent in projected vehicle emissions realized in this pilot are remarkable," said CMU President Jared L. Cohon. "I'm proud of CMU's team, which developed this first-in-the-world technology, and am equally proud of the partnership approach typical of Pittsburgh that made this pilot possible." The next step will be to expand the pilot to demonstrate the technology on a bigger scale in East Liberty. Eventually the technology may be deployed in other Pittsburgh neighborhoods. Traffic21 was launched in 2009 with funding from the Henry L. Hillman Foundation. Grants to Traffic21 from The Heinz Endowments' Breathe Project and from the Richard King Mellon Foundation provided the funding for the pilot.